HTC has not only achieved the excellent market performance in the third quarter, its smartphones have also become the competing customized object of the operators. 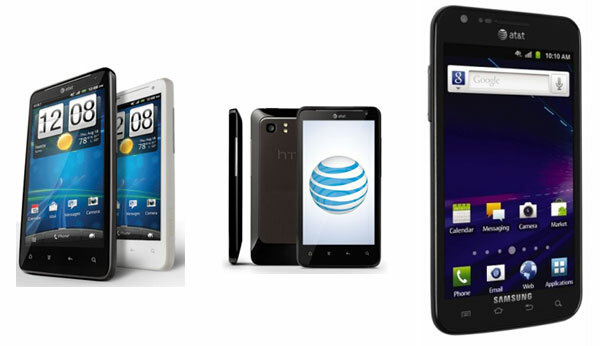 A few days ago, the American operator–AT&T ,who is stepping up to found their fourth generation: LTE network has officially launched the 4 G smartphone HTC Vivid; and it is expected that the cell phones will be on sale on November 6th. Although HTC Vivid is the latest released phone, you will not feel strange when you see the different trapezium design on the back of its body .That’s right, this machine is the HTC Holiday which has been exposed for many times before, or it rather can be said as the north American version —HTC Raider 4G. Powerful hardware configuration and high-speed Internet function are the main features of the cell phone. 4.5-inch qHD IPS touch screen has been used on HTC Vivid this time in order to let the users make better use of 4G network to browse the web or watch video online. However, the touch interface has not picked up the latest version but the HTC Sense 3.0; this touch interface supports many functions: multiple unlock modes with gorgeous dynamic effect; new improvement on the aspect of weather display; different voice background and excellent animation effect. There are some differences between HTC Vivid and HTC Raider 4G on the aspect of processor allocation: the 1.2 GHz dual-core processor has replaced the dual-core Qualcomm MSM8660 with 1.5 GHz main frequency; However, at present, the specific information of the specific models has not been known. The dual camera configuration with 1.3 million pixels sub camera and 8 million pixels lord lens has also been adopted by HTC Vivid . Among them, the sub camera can support 720p HD video recording function, and the lord lens on the back of the camera is equipped with dual LED fill light , and it supports automatic focus and 1080p HD video shooting function. In addiction, in order to deal with the problem of shooting effects when in the low light environment, this machine has also used BSI CMOS sensor, and the 28 mm wide Angle lens of the mobile has been equipped with f/ 2.2 large aperture. HTC Vivid also carries Android 2.3.5 operating system, and it provides the LTE high-speed network which is based on 4G standard. And as for the other functions of the mobile phone, it is characterized with the 16 GB storage capacity ,1 GB RAM space, bluetooth 3.0 technology, Wi-Fi wireless Internet accessing , GPS navigation and memory card expansion. Thare are two color designs of HTC Vivid for your options: white and black. And it is expected that it will be on sale on AT&T online store and retail shops on November 6th: its contract price is $199,99. In addition to the 4G smartphone HTC Vivid which is customized for AT&T, the advertising that come from the operators of HTC Rezound with quite high exposure rate has been recently exposed .According to the exposed information, it can be basically predicted that this device will be equipped with “Beats sound technology”, thus it has become the first model integrated this sound technology in north American market . It also means that the machine can bring more vigorous and stronger bass, and clear natural sound quality performance for users. Similar to HTC Sensation XE, it can be seen from the leaked screenshots of the advertising that the machine will also randomly send the earphone “Beats by Dr.Dre” of original factory. As for the several past exposure, we have a certain extent of understanding to the main features of HTC Rezound. This cell phone will be equipped with 4.3’’ 720 p HD touch screen and the built-in 1.5 GHz Qualcomm Snapdragon MSM 8660 dual-core processor; what’s more, it will provide 1 GB RAM to realize more fluid control speed; and it can bring better 3D gaming and multimedia expressive force for the reason that it has integrated Adreno 220 graphics processing chips. It is reported that this cell phone is introduced for the American operator: Verizon, and it will be officially issued on November3rd. And in accordance with the past leaked product branching program, the cell phone will be delivered on November 20th. How to Enjoy Your Favorite Movie/Music on HTC Evo 4G? How to rip DVD Movies to HTC Legend/Hero on Mac? How to convert DVD to HTC Flyer? How to convert Blu-ray to HTC Flyer tablet? How to Convert Video to Flyer for Any Video Playback? How to convert DVD to HTC Flyer on Mac?